There is no doubt that the heart and soul of Zuccon International Project is its founder. What would you select as your highlight this year, maybe Navetta 37? Certainly, this year, Navetta 37 by Custom Line. This project represents an important moment of transition in the history of the brand, since it can be considered the beginning of a new interpretative path of the brand philosophy. The Navetta 37 stands out for her characterizing style that, even though it differentiates itself from the past, doesn’t lose sight of the “life” contents that characterized the previous explorers. Which projects you see important for the future and why? Considering the ‘attention’ that we always dedicated, together with our shipyards, towards the creation of new products, every single one we are working on is important, but, particularly, – in our opinion – the most determinant will be those which will pay specific attention to the human and its possibility of living the space in the most complete way. Can you give us an example of ‘non-yachting’ design you have carried and describe why you find it important? During our long designing experience, always marked – by choice – by a condition of multidisciplinarity, we created for the ESRIN, the centre of the European Space Research Institute in Frascati, near Rome, different typologies of buildings: offices, canteens, data elaboration centres, computer labs, among others, and all are used by an international community, therefore characterized by different cultures. Our greatest satisfaction has been, and still is, not only the possibility of continuing the collaboration going on for 35 years, but most of all the positive feedbacks on the quality of the architectures and of the spaces from the people who live them every day. 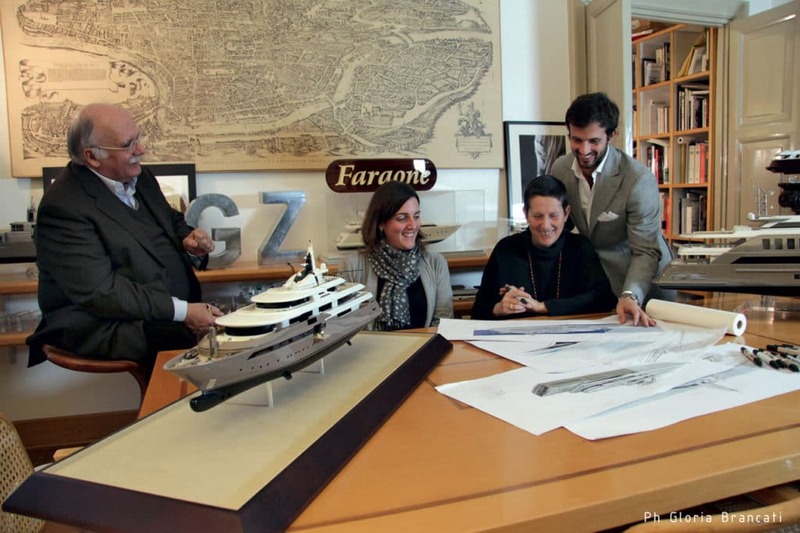 Can you comment today’s cooperation with the new Ferretti management and with extremely successful Custom line? The history of our studio for more of 40 years has been characterized by the ability and the willing to build long-lasting relations with our clients, in the firm believing that the quality of the design expressed in the products is strongly linked to the quality of the relations created between designers and clients. Familiarity, reciprocal trust, respect and, above all, ethics are and always have been the irreplaceable conditions for allowing us to work up until today with Ferretti Yachts since 1990 and with Custom Line since 1995, year or the brand’s foundation. New materials, do you see something significant on the horizon? Certainly, there are a lot of news in the industry, but the glass in our opinion is particularly important, since it influences more directly the definition of the interiors spatial quality and of the life on board, as well as the design of the superstructures, to which the interior spaces are strongly connected. Working with a family must be a real joy. Can you describe it and explain the roles in your studio? It goes without saying that working all together – dad, mum, son and daughter – is beautiful, because it strengthens even more the family relationship, increases the number of occasions for reciprocal confrontation and subsequently increases the levels of knowledge among all the members of the family. This does not mean that everything is easy. Everyone needs to work harder, to understand the limits within which one must act, because, of course, there are higher levels of complexity. Since 1973, year of the marriage with Paola, everything has been joined together in a united process, where friendship, ‘love’, enthusiasm for work, shared targets, successes and defeats have always been united, and where later Martina and Bernardo found their position. Martina is more like her Mum and Bernardo is more like his Dad, and they are both contributing decisively, together with our associates, to the necessary and continuous evolution of the Studio, not only because of their education as architects, but also because of some important general principles which they received from the Studio: love and attention to the project, respect and consideration for the history and, above all, respect and consideration for the people. I’ve been in Croatia, but I don’t know the country very well. I’ve only been in Spalato and Dubrovnik; I spent incredible days in Mljet, but we didn’t take the travel that we wanted yet and that we hope to do very soon: navigating among the islands and getting to know them well.